For the second day in a row, more than 100 people got arrested outside the White House protesting the Keystone XL pipeline. 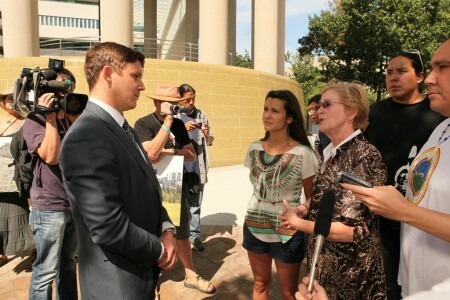 A group of Canadians also delivered a letter to the Canadian ambassador to the United States, calling on him to stop promoting the oil sands. That seems a distant prospect. Canada seems determined to dig up and burn as many fossil fuels as possible, no matter how unjust that may be or how much it will worsen climate change. Hopefully Obama will block this pipeline and help keep that Canadian oil buried. In so doing, he would do a great service to Canada in the long term. Climate change is not in out national interest, and the transition to renewable energy can only e delayed by the expensive and harmful pursuit of the world’s dirtiest oil. This morning, 111 protestors sat in at the White House to oppose the Keystone XL tar sands pipeline at day 12 of the Tar Sands Action. Demonstrators included David Daniel, whose land in East Texas would be cut in half by the Keystone XL pipeline, and Ben Gotschall, a 4th generation rancher from Nebraska, where the pipeline threatens the Ogallala aquifer that supports the states agriculture and environment. They were joined by a large contingent of organizers from across Appalachia, who not only suffer the worst of the fossil fuel industry’s abuses, but have also been pioneers in fighting back. They were joined by folks from across the map, including a group of mothers from New York, organizers with 350.org, and even one demonstrator from Alaska. Environment minister Peter Kent has voiced his support for TransCanada’s proposed Keystone XL pipeline, as protests against the project continue in Washington. Protests against Keystone, and the oil sands, remain tiny compared with other public agitation around the world, or in the past. The U.S. civil-rights march in 1963 drew more than 200,000 people. This year, the battle against Egyptian president Hosni Mubarak quickly pulled more than one million people to the streets. In Israel on Saturday, an estimated 300,000 gathered in Tel Aviv to protest against lack of affordable housing, dim employment prospects for young people and other issues. For the oil sands, protest organizer Bill McKibben said the arrest strategy made the two weeks in Washington a success. It drew attention that anti-Keystone activists had previously failed to garner. Mr. McKibben, founder of environmental group 350.org, said civil disobedience would be employed again against Keystone on Parliament Hill in Ottawa on Sept. 26, and during the final months in the U.S. ahead of Mr. Obama’s decision. And while it looks like environmentalists face another loss in the face of likely approval of Keystone, Mr. McKibben is unwavering.